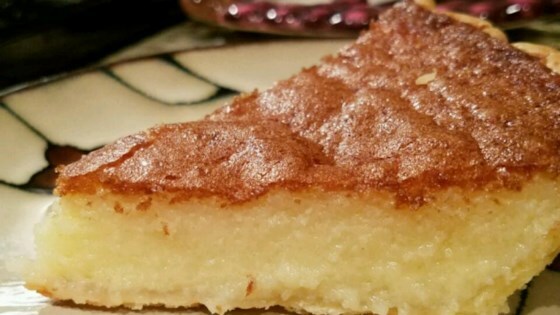 "This simple buttermilk custard pie is an American classic." In a large bowl, combine sugar and flour. Beat in the eggs and buttermilk until blended. Stir in the melted butter and vanilla. Pour filling into the pie crust. Bake in the preheated oven until filling is set, about 45 minutes. A traditional Southern sweet and rich pie. This is very similar to the buttermilk chess we make at my restaurant. The only difference is that we add 4 ounces of dessicated coconut inside the shell before pouring in the filling. absolutely awesome and easy as can be. I did find that I had to cook it about 10 minutes longer then the desired amount on the recipe card. We all loved it and it stored so nicely in the fridge. Make sure the pie crust is deep-dish. Easy, quick and yummy!!! It was so easy to make, I agree with the other the prep time was 5 min not 30. Very sweet next time I would use less sugar.